Posted on Friday, June 21st, 2019 at 2:00 pm. 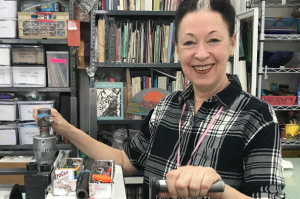 Join with guest artist Kathy Caraccio, master printer from New York City, here to celebrate her Quilt Series exhibition at the International Quilt Study Center & Museum. In this exciting workshop we will create monoprints onto interesting papers for colorful rainbow blends, textures and layers. These printed sources will be cut into shapes to arrange into quilt like designs and patterns that create dynamic visual interactions. These one-of-a-kind collages of paper will be glued and mounted for a finished presentation. Printing hints and tips from Kathy’s vast knowledge will enable collaboration throughout the workshop allowing all to learn and discover. Posted on Saturday, May 18th, 2019 at 1:00 pm. Make beautiful handmade paper with inclusions of colored pulp wet into wet. 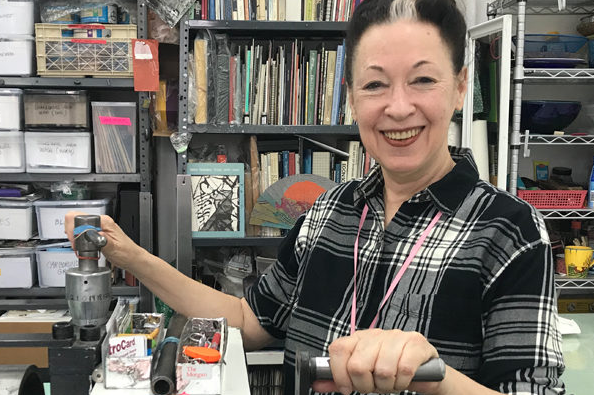 Fluid squeeze-bottle drawing and designs can make the paper sheets inspiring when dry for further drawing, calligraphy, printing, and bookmaking. Posted on Thursday, January 24th, 2019 at 6:30 pm. Posted on Wednesday, January 23rd, 2019 at 6:30 pm. Love all those great patterned cotton fabrics out there? Have remnants in your sewing box? Turn those interesting fabrics into lined bookcloth that can be used for covering your own books, boxes, and projects. All cotton works best, and we will have some to use on site also. Posted on Saturday, October 13th, 2018 at 9:30 am. Build the amazing clamshell box, with a specially designed divided tray inside. Materials and skills follow functional structure that can enhance an object for its presentation, preservation, viewing and meaning. Bring a small object or special book to plan the box around, with a standard size for all. Posted on Saturday, September 22nd, 2018 at 10:00 am. We will make one-of-a-kind prints from ink that is transferred from plates to paper with an inevitable surprise. Using a wide array of colors the water-base inks enable multiple layers and unusual mixing. Guidance and demos of techniques will spark ideas and sharing. All for experimentation and fun! Posted on Saturday, August 4th, 2018 at 1:00 pm. A hands-on workshop that begins with playful paper selections for signatures and folding, all joined together with sewing along the spine. A variety of decorative stitch options will be shown. This journal will have durable cloth covers and be suitable for take-a-long journaling and sketching. Posted on Wednesday, July 25th, 2018 at 6:30 pm. 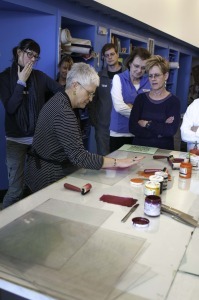 In this hands-on workshop we will make traditional and decorative papers with Turkish Marbling. This process is fast and fun with unique results. Papers can be used for calligraphy, origami, small gift-wrapping, note-cards, bookbinding. Expect the Unexpected!